What Are Clutch Noises Telling You? Noises coming from your clutch can be a bit unnerving. They can also be a pain to diagnose, especially when a noise is all you have to work with. Still, your ears can tell you quite a bit about your clutch and drivetrain. So listen close and use the information below to try and diagnose your transmission noises. Squeal and growls. These kinds of noises are typically indicative of worn or seized release or pilot bearings. Chirping. These noises are caused by vibrations in the actuator system usually caused by worn contact points on the clutch ball/ball stud interface. Rattling. This usually points to issues that need to be addressed with a dual mass flywheel. 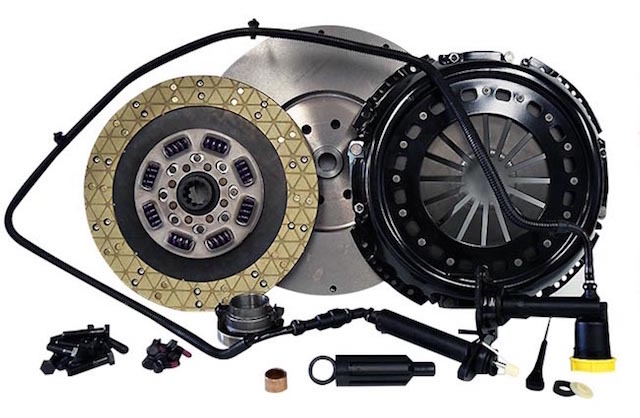 If your vehicle has a solid flywheel, it can point towards clutch disc damper failure. You can now isolate these possible sources and identify the root cause. Check the transmission bearings. Do this by leaving the clutch engaged by not compressing the clutch pedal. If you hear a growl or grind, the transmission input shaft has a bad bearing. Check the clutch release bearings. If you notice chirping noises, push the pedal in with the vehicle still in neutral. If the noises go away when you load the pedal, the problem is with the clutch fork and pivot stud. Check for worn components and replace. Make sure you apply a small amount of grease as required to the ball stud / clutch fork interface. If the noise gets louder when you push the pedal further in, the clutch release bearing is bad. Test the pilot bearing. Push in the clutch pedal, listen for squealing noises. If there are squealing noises when the engine speed and input shaft speed are different, the pilot bearing is bad. Check for fork vibrations. Very lightly push in the clutch pedal and if the noise goes away, there’s probably a fork vibration problem. This vibration won’t occur when load is released. Check for worn components and replace. Make sure you apply a small amount of grease as required to the ball stud/clutch fork interface. Know about gear rollover. Gear rollover, gear rattle, or gear lash noises are commonly associated with a lightweight flywheel. This noise occurs when the vehicle is neutral and idling. It’s a rapid tapping, clicking, or rattling. Many compare it to marbles in a jar. This is a normal part of having a lightweight flywheel. We have a few suggestions on reducing this noise in this post. Now you know what these noises mean, and it’s time to fix the problem. If you still can’t seem to pin down the noise, feel free to contact us for further assistance.